Creighton University in Omaha, Nebraska is attended by about 9,000 students and known for its stellar alumni network, a 16-year streak as US News and World Report’s “Number 1 Midwestern University” ranking, and Doug McDermott (pro basketball player and NCAA leading scorer in 2014-15). It has a long-standing tradition of excellence and distinction, both academically and athletically. Standing at the helm of Creighton’s athletic training efforts is 20-year veteran athletic trainer Ben McNair, ATC and Director of Athletic Medicine. McNair selected HydroWorx to be part of Creighton’s athletic training “toolkit” roughly five years ago, coinciding with the construction of The Championship Center in 2014. 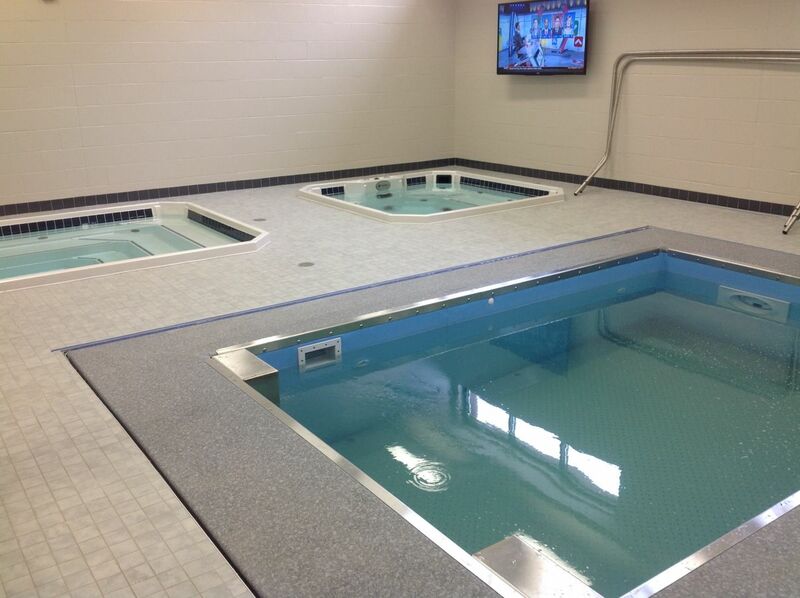 Curtis Self, ATC and Bluejays’ Associate Athletic Trainer says the two HydroWorx “dip” pools and the 2000 Series pool make the aquatic room the most heavily trafficked area of the training room, being used heavily before, during and after practices. Athletes from all of Creighton’s 14 Division 1 Big East Conference sports use the pools. The athletes’ use of the pool is twofold: both as they rehab injuries and also as they condition, regularly utilizing the benefits of hydrostatic pressure, buoyancy, viscosity, and un-weighting in warm water. Some athletes benefitting from the pool have a more non-descript injury, like joint swelling, with no related incident or trauma. “We get these kids in the pool and they just walk. The hydrostatic pressure along with the resulting muscle activation help to get some of that swelling down. Clicking disappears. And sometimes all it takes is a 10-15 minute walk,” concluded Self. However the three HydroWorx pools are used at Creighton—whether its rehab or recovery—we’re proud to be part of their robust effort to bring healing and longevity to their student-athletes.